Like the original, the Escape is a 4-strut SLE (Supported Leading Edge) all-rounder with a medium aspect ratio. It has been improved on some critical points, making it even more user-friendly and durable. As it is tested in the rough elements of the North Sea the Escape performs in whatever conditions mother nature throws at you, from the most washed up, choppy, gusty and challenging conditions to the most ideal tropical island breezes. 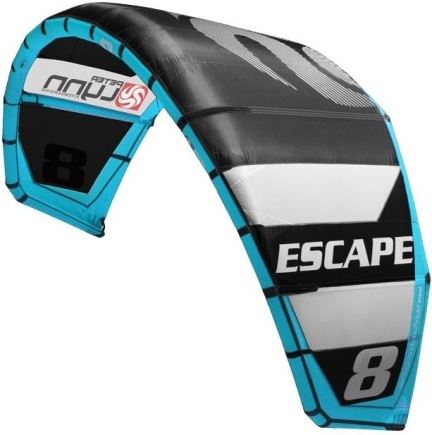 The Escape is hands down one of the most comfortable and easy to use kites out there for beginners and intermediate riders. Next to that, its exceptionally good performance will also let expert riders get more out of their sessions and progress fast, the Escape is that versatile! A balanced mix of light weight and stronger materials has resulted in a lower weight of the kite and adds to responsiveness and overall control. I'm now about 8 months in possession of a set of Peter Lynn escapes, found it time to share my thoughts of these kites. at the reception: upon receipt of the kites fell that the kite is equipped with bar (and barhoes), leash, pump, bag, inner bag (super convenient for travelling) and an extensive repair kit. first time sailing: kite: kite is useful to pump with the one pump system, and wear on various sensitive points is strengthened. You can also change bar pressure, I personally think bar pressure is nice so got it right on high bar pressure. also with the lesser bar pressure feel your kite still rank well. kite is in many places extra stitched against protection. kite reacts directly, and has a fairly tight turning circle, but less than his brother the Swell. There is pretty much lift in the kite, and by a little technique he will keep you long in the air. the kite in the air feels very familiar, you'll know exactly where he stands. This challenges you right out to new tricks. low end: someone who has a low wind kite are looking for can this scratch-out soon, because the low end is okay, but not nearly as large as that of his brother the Fury. high end: the high end is very very good, I have me this year actually never "overpowered" felt, the kite flies also fine above the 25/30 knots. because the high end is very good I'll sail like a bigger, I will have a lot more power and my hang time is like never before!! same story for the lift, it is awesome! the wind range of the kite is quite large, making an 11-7 or 13-9 combination possible. during a down winder remains the kite rank well and he holds good pressure, he have a good drift. kite has simple bridles with 1 pulley what works well. the bar: the bar comes with useful bar bag. the bar itself soft to the touch, at some bars I get personally fast blisters but that is certainly not the case here. depoweren is easy with the clamcleat, also while you're cruising. There are even complaints about the safety system that it is not working well, here I have personally never experienced this, I think it works fine. kite flags on 2 power lines. the swivel is just above the chicken loop and turning very very smooth. because the swivel is close to you, you can easily untwist your power lines while cruising. also use of the bar after 8 months of intensive running the swivel still like new, very smooth. the bag: bag is pretty spacious and sturdy, I personally find this rather fine, am not such a King in kites fold down to a small size. There is a separate box for your bar in, pump can be mounted on the outside. also there are straps on the bag so you can tighten your board on your back, very nice. because there is a inner pocket present, you run no risk of cracks in your sail because he comes between the zipper. There's still a relatively small box for a repair kit etc. bag is quite soft and is sitting on your back user friendly. conclusion: the escape is a good all round kite keeping your soon familiar. the kite challenge you to do new things. kite is very stable and has a good high end. 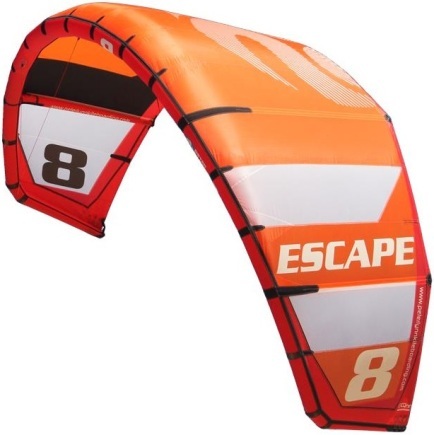 so are you looking for a solid, well finished all-round kite then you should definitely consider the escape! Hi Jules, what do you mean with kite feedback level is failed? @stefarius: the statistics of my review shows me a empty box by the "kite feedback" , but the feedback of the kite was fine. Did test the Espace for a short time. When i started there was not that much wind, but it picked up quite quickly. I got nice and high on this kite, and also the hangtime is quite long. Nice amount of pop, so also good for freestyle. I have tested this kite in all kinds of conditions riding the 7m and 9m. It is an easy Kite all round. It does everything adequately and if riding from freestyle to big airs to waves is your thing this kite is really adaptable to any style. I have been riding the kite for about 1 ½ year and the last six months I spent my time in Cape Town for my internship and of course: kitesurfing. I have been riding with the 7m and 9m Escape 2013 as well as the 2012 version. I did about 60 - 80 kitesurf sessions with the Escape’s in the most extreme conditions of Cape Town, and those are the roughest. The kite is good for massive jumps, fat kite loops and nice pop for freestyle. But I did a lot of wave riding as well. The kite is good for wave riding because of its smooth and direct turns and the massive depower. Riding waves is really fun and the kite makes it easy for everybody. You can easily make massive jumps because of his great lift, but the kite keeps it power and pressure, even when you’re about the land with a massive speed. I’m very thankful for the kite for all the times that it has saved me from bone braking landings. The 2013 print is totally different, and in a good way. The kite has a nice new coat and Peter Lynn improved the shape and the seams in the sail. The seams are sticked vertical and semi horizontal, to improve the strength of the sail. The shape didn’t changed much, but it looks like it’s more rugged. The designer of Peter Lynn shortened the bridles to prevent annoying situations which lead to a more user-friendly kite. They also put an anti-stuck system on the tips of the kite, so the bridles won’t get stuck on the tips. The bar is pretty much the same as last year. The bar is strong, nice grip and the de-power system is very easy to use. There is a new bar in the development, which is recommendable because the safety system is not the easiest to use. I checked the lines customarily, because I hate uneven lines. I don’t know what kind of lines they use, but I’m very impressed about them because they don’t stretch. The bar is being delivered with 22m lines, with extensions of 2 meters. The bar pressure is a little bit less than a C kite, but has more pressure than a regular SLE kite. For me very important when you are hanging 10 meters in the air. For freestyle and freeride very comfortable, because your arms won’t get pulled out of you torso but you are still able to feel the position of the kite. A friend of my who just got into kiteboarding wanted to try the 7m Escape 2013. For the first time he was able to ride upwind and he for the first time he knew where the kite was, without looking to it. He was very enthusiastic about the kite, that he wanted to buy one. You can compare the Escape with one of the better quality kite’s on the market, which is available for a fair and affordable price. Peter Lynn is a new player in the inflatable kite market, but they sure can European quality kite’s which they already make for more than 20 years.